In London, the sinister Problem has arisen: ghosts are coming back from the realms of the dead. Only children with psychic talents such as Sight, the ability to see ghosts clearly and see death glows, Touch, the ability to feel what an object of spiritual importance has been through, and Hearing, the ability to hear the whispers of ghosts and talk to the very powerful ones, can sense these undead. All ghosts being deadly to humans at some degree, causing multiple agencies to spring up and protect the public (and get rich) with only iron, silver, salt, and lavender. 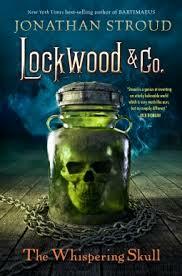 Lockwood & Co. is a small company (unlike Fittes) that is run free of all adult supervision. The members are Lucy, the narrator, a smart, resourceful, and sassy girl who can talk to legendary type threes, Lockwood, a nonchalant, calm, mysterious teenager who is a deft hand with a rapier, and George, the unhygienic researcher who is fascinated with the type three ghost that is in the silverglass jar. However, they are constantly being thwarted by Quill Kips and his Fittes team, Kipps bagging the jobs they signed up for. When a deadly phantom was awoken by George and a mysterious bone glass being stolen, Lockwood and Co. must avoid relic-men, communicate with a spiteful, sarcastic type three ghost to discover who, or what, is behind all of this before Kipps and his gang. This sequel is a great thriller that will keep you reading until the very end. This book has many strong points that will have you suggesting this book to friends and family in a single read. Jonathan Stroud has two of the characters grow in astounding ways. George, at the beginning, scrimps his work while pursuing his personal interests and complains all day. Later, however, he researches all he could and works hard in dire circumstances. Lockwood at first is a extremely solitary person who doesn’t share much about his past. Throughout the story, he reveals more and more of his past, his association with Kipps, and other secrets. Another strong point is the fact that this book is old ideas made new and refreshing. Silver, iron, and lavender have always been thought to be protection from things of the dead, but there have never really been competing agencies and bureaucracies. Overall, this book has wonderful characters and refreshing ideas, and it and it’s prequel, The Screaming Staircase, should be on anyone’s “to read” list.